Linda and Peter Payzant have been interested in butterflies and moths for over thirty years. Like many who find these insects fascinating, they began by making a collection, which eventually grew to the point where it had to be donated to the province. They no longer collect, preferring instead to observe and photograph. They have both been active in local natural history organizations, serving on various boards, leading field trips, giving talks and contributing articles to newsletters. 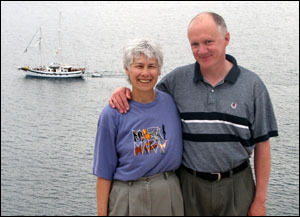 In 2011, they were awarded the Norman Criddle Award by the Entomological Society of Canada, recognizing the contribution of outstanding non-professional entomologists to the furtherance of entomology in Canada. The Payzants look forward to learning more about the butterflies of Nova Scotia.